Click Here - To see how Orange County evolved each decade - includes all the known towns and villages. Click Here - To view the significant Education events for Orange County since the county was formed. Click Here - To see the known battles/skirmishes in Orange County during the American Revolution. Click Here to go to the official website of the Orange County government. Click Here to learn more about the known airports in Orange County. Orange County was created in 1752 from Johnston, Bladen, and Granville counties. It was named in honor of the infant, William V of Orange. The first court house was authorized to be established in 1754 where the western path crossed the Eno River on the land of James Watson. Childsburg was established in 1759, its name was changed to Hillsborough in 1766, and it has been the county seat of Orange County ever since. The following comes from Orange County 1752-1952, edited by Hugh Lefler and Paul Wager, printed in Chapel Hill in 1953 [with significant edits]. In 1740, only a few white families were scattered along the Hyco, the Eno, and the Haw Rivers in the area that became Orange County, North Carolina. In 1748, there were approximately twenty taxables, but by 1751, Royal Governor Gabriel Johnston reported that settlers were "flocking" in mostly from Pennsylvania. Alexander Mebane, the county's first sheriff, returned 1,113 taxables for the years 1752 and 1753, a figure which would indicate a total population of roughly 4,000 when the county was established in 1752. By 1767, Orange County had the largest population of any county in North Carolina. Grants on New Hope Creek are recorded in Bladen County as early as 1745, and along Deep River in 1749. There were grants along the Hyco River in what became northern Orange County in 1748, and along the Dan River, the Hogan Creek, and County Line Creek in 1751. In what became central Orange County, grants on the Eno River were entered for the year 1751. The Eno community, about seven (7) miles north of Hillsborough, was the most distinctly Scots-Irish settlement in the county. The Scots-Irish also lived east of the Haw River. One of the largest landowners in that area was Samuel Strudwick, an Englishman, who was granted land in the Haw Fields to satisfy a debt which Governor George Burrington owed his father. William Blackwood's grant on Buffalo Creek was entered in the land grant office in 1752; Gilbert Strayhorn's on Prestwood Creek in 1755. Alexander Mebane, the first sheriff, owned land along Cain Creek in 1756, and James Hunter owned land on Stinking Quarter and Sandy Creeks in 1757. James Stockard's land was in the Back Creek section and William Montgomery's land was on the Buckhorn Creek. Marmaduke Kimbrough, who built the first court house for Orange County, entered his 640 acres on Pole Cat Creek in 1752. Germans settled on lands west of the Haw River, the pioneers of this group being Lutherans. Ludwig Clapp's grant of 640 acres on the Alamance River was recorded in 1752. Michael Holt's large acreage lay along the Great and Little Alamance. John Faust had land on Cain Creek, and Adam Trolinger on the west bank of the Haw River. Among the pioneer Germans were Christian Faust, Jacob Albright, Peter Sharp, Philip Snotherly, and David Efland. By 1773, there were so many Germans in western Orange County that J.F.D. Smyth, an English traveler, experienced difficulty in finding anyone who understand his language. English emigrants from Virginia settled in northern Orange County along the Hyco River and County Line Creek. "South Ireland" near Stoney Creek, in present Alamance County, indicates the Irish element. Thomas Lloyd, one of the first representatives from Orange County to the colonial General Assembly, was foremost among the Welsh who built homes between Hillsborough and Chatham County. His grant on Mark Creek was entered in 1757. Quakers constituted a considerable portion of the early populataion of Orange County. There were 950 taxables in 1755, but there were only 490 on the militia list. This sect settled north of Hillsborough, but they were most numerous in the Cain Creek and the Stinking Quarter Creek areas, in present Alamance, Chatham, and Randolph counties. Jonathan Lindley of the Cain Creek section and William Courtney of Hillsborough were prominent Quakers. Orange County and St. Matthew's Parish were formed in 1752 from the western portions of Granville, Johnston, and Bladen counties. Phenomenal growth in population between 1740 and 1752 made a new county necessary. At the time of organization, Orange County was bounded on the north by the colony of Virginia, on the south by Lord Granville's line, 35° 34', and on the east by Granville, Johnston, and Bladen counties. 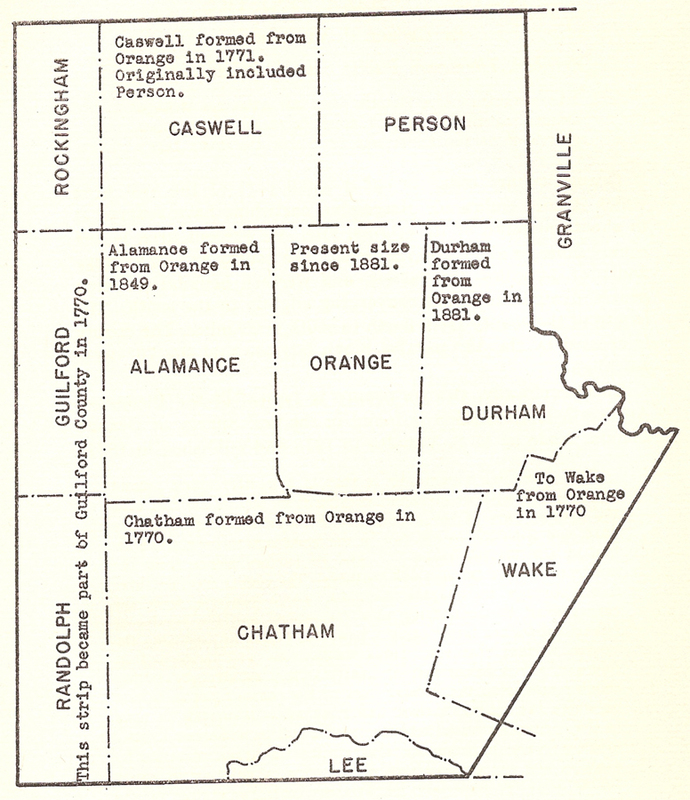 After the creation of Rowan County in 1753, Orange had a definite western boundary. There have been several subtractions from the original Orange County of 1752. In 1771, Orange ceded land to the newly-established Guilford County and Chatham County. In 1777, Caswell County was carved out of the northern portion of Orange County - which included the later established Person County. In 1849, Alamance County was taken from the western side of Orange. Finally, in 1881, the eastern section was ceded to the new Durham County. These numerous subtractions left the current Orange County an area of 398 square miles. 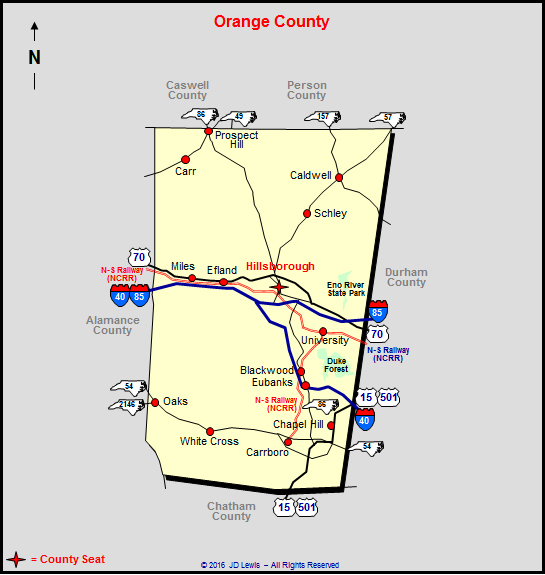 Today, Orange County is bounded on the north by Caswell and Person, on the south by Chatham, on the west by Alamance, and on the east by Durham counties. The Court of Pleas and Quarter Sessions of Orange County held its first session at the home of John Gray near the Eno River on September 9, 1752 with eight Justices of the Peace present. These justices voted to build a court house on the north side of the Haw River within two miles of Piney Ford. Marmaduke Kimbrough was awarded the building contract, which called for a building "thirty-two feet long, twenty-two feet wide, and eleven feet thick, framed and weather boarded with feather edge plank and shingled roof." With the organization of Rowan County less than a year later, Piney Ford was only fifteen (15) miles from the new western boundary, so it is unlikely that this court house was ever built. In 1754, the present town of Hillsborough was chosen as the permanent county seat, located where the old Trading Path crossed the Eno River, near the picturesque Occoneechee hills. William Churton, in 1754, laid out four hundred (400) acres as a town and commons, on land that had been granted to him that same year. The county court named James Watson, Josiah Dixon, and Lawrence Thompson commissioners and trustees for the new county seat, which was called Corbin Town, in honor of Francis Corbin, a member of the governor's council and the Earl of Granville's land agent. The North Carolina General Assembly authorized the building of a court house in 1754. Corbin Town was incorporated as Childsburg in 1759, in honor of Dr. Thomas Child, Attorney General of the state from 1751 to 1760 and another land agent of the Earl of Granville. In 1766, the name was changed to Hillsborough to honor the Earl of Hillsborough, the recent British Secretary of State for the colonies. In 1770, it was formally recognized as a "borough town" and thereafter was entitled to a representative in the colonial House of Burgesses. There have been four court houses in Hillsborough. The first was ready for use in December of 1756. In 1778, the new state legislature authorized the building of a district court house on the site of the first. Citizens of Orange, Granville, Wake, Chatham, and Caswell counties paid taxes "to take care of the building costs." Nathaniel Rochester - who later founded the New York town by that name - and William Courtney announced in the North Carolina Gazette, June 28, 1778, that a contract would be let for a brick building; however, a frame building was most likely built. After this building was destroyed by a fire in 1789 or 1790, a new district court house was authorized by the General Assembly. One September 7, 1844, the corner stone was laid for a fourth court house, an building which has now been used for more than a century. Captain John Berry was the architect and contractor for the new brick building, an example of classical architecture with doric columns, and built for a total cost of $10,000, over budget by nearly $2,000. Joseph Maddock built the first prison and "ground pinned" it in 1757 to make it stronger. That same year, the sheriff was instructed to provide stocks, a pillory, and a whipping post. The second jail was erected in either 1764 or 1765. After this one burned, a district jail was built in 1771. Another was authorized by the legislature in 1798. Building commissioners were appointed for a new prison in 1836, which was to be forty-five feet long, twenty-four feet wide, and two stories high - its cost not to exceed $4,000. John Berry was awarded the contract for the stone building, which was completed in 1837. In 1846, John Christmas erected new gallows which were moved in 1850, by order of the court, to "the old place called gallows hill within the town commons" - in the western part of Hillsborough. Click Here to learn about all of the known officers and men who served in the Orange County Regiment of Militia during the American Revolution. All names in "blue/underscore" can be clicked on for additional information. Click Here to view / download eight road maps of Orange County.